Every year for Christmas, my husband and I give each other bulbs to plant indoors, for the New Year. I always give Amaryllis bulbs, at least one, but sometimes two or three, depending on the price. My husband gives me Paperwhites and maybe an Amaryllis, as well. This year, I got both, plus six Hyacinthe bulbs. Hmmm, I wasn't sure about them! I had already bought in potting soil and dug out the pots before they had a chance to freeze themselves together in the shed. In fact, this year the ritual went very smoothly - practice does make perfect!!. The pots, even the cracked ones, shone, after a good scrub; all the bulbs fit in all the pots and there was even enough soil to top everything up. That is, everything worked, except for the Hyacinthes. Yes, I could just go out and buy another pot, but I wanted the task to be finished. What could I do? Then I remembered giving a neighbour of mine a small gift for her birthday one February. It was a Hyacinthe bulb in a curved vase, that showed the flower's roots growing in water. I could do that! I dug up, pardon the pun, some large plastic drinking glasses - OK, they are from The Beer Store. Sometimes, when we improvise, old habits surface :) I stuck each bulb with four toothpicks and balanced it just slightly above a full glass of water. Fortunately all the glasses fit on the kitchen window sill - the perfect stage for my botanical theatre!! I did, though, have to explain the "line up" to the kids. This was my grow-op, I said. 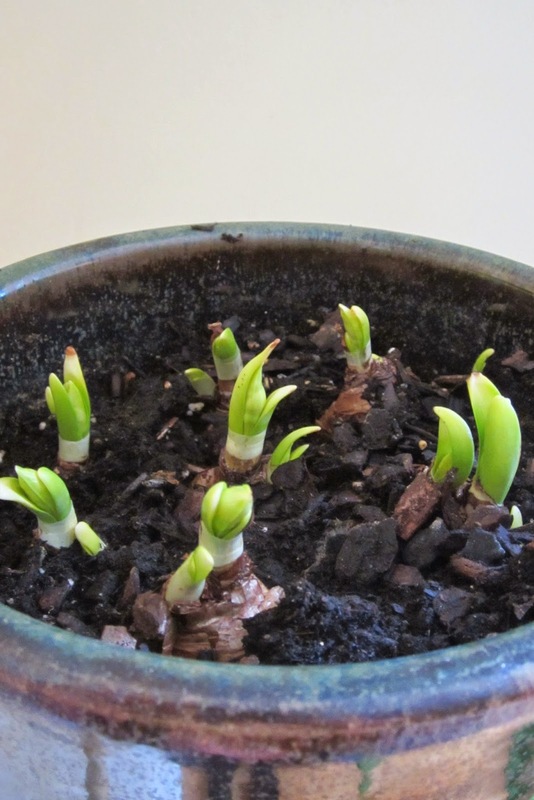 Yes, some people can get "high" on Hyacinthes :) Maybe, you just have to be a gardener to understand the joy that can be found in a tangle of white roots and an emerging green shoot - the legal drugs that get us through Winter! !